The STRONGBACK Excursion is the first off-the-shelf standard folding manual wheelchair to provide frame-integrated effective posture support. 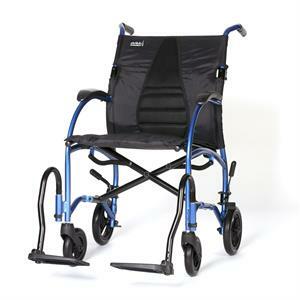 Its unique shape promotes healthy upright sitting and ensures comfort from the first moment. The ergonomic curved back supports the natural lumbar curve of the spine for comfortable, upright, and healthy posture, and the improved seat angle aligns the pelvis for proper ergonomic posture and prevents slipping and slouching forward. The STRONGBACK Excursion does not only comfort the user's back, but it also exhibits all the benefits expected in an ultra-lightweight wheelchair; it is easily foldable, simple to use, and highly portable. Size (unfolded): 41" x 25" x 36"
Size (folded): 23" x 12" x 29.5"
Please call 800-873-7121 to place an order or come to our store to purchase. Lower price available in store.